The postcard shows the Hotel Paso Del Norte, it probably dates from the early 1940s. 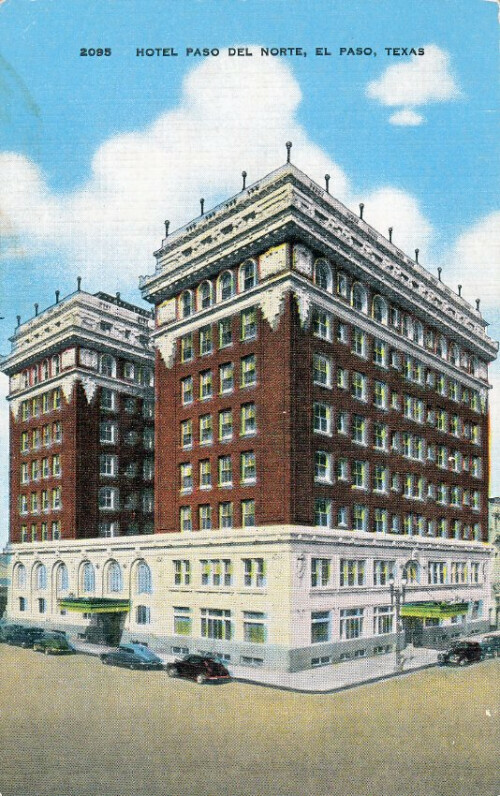 The Hotel was built in 1912 by Henry C. Trost. The building was made out of steel, brick and terra cotta. The interior was very elegant, especially the ornate lobby, which was topped with a Tiffany glass dome. The building was remodeled and renovated several times. Over the years, the Paso del Norte Hotel became a hot spot for cattleman, ranchers, and especially for guests to see the Mexican Revolution from the rooftop. In 1993, the Angeles Corporation of Mexico purchased and renamed it Camino Real Hotel. It is situated on 101 S. El Paso Street. so great to see all these buildings still standing up. all this brings back wonderful memories. This is a wonderful building.